Be the first to share your favorite memory, photo or story of Kay. This memorial page is dedicated for family, friends and future generations to celebrate the life of their loved one. Age 71 of Vernon passed away Friday, November 2, 2018 at her home. Funeral Services will be held on Tuesday, November 6, 2018 at 11:00 am. at the Nelson-House Funeral Home, Owosso. Pastor Marlene Webster will officiate. Kay was born September 17, 1947 in Owosso, the daughter of Clinton and Hazel (Tobey) Parkinson. 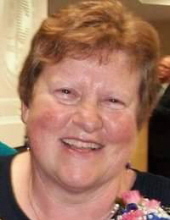 She graduated from Corunna High School; Class of 1966. Kay was devoted to her crafts and was a member of the Shiawassee Spinsters Spin Guild. Kay had also been the Township Treasurer of Rush Township for 8 1/2 years. She worked at GTE for 15 years, drove the bus for the RESD for 7 years and was a substitute bus driver for Corunna School for 4 years. Kay is survived by her daughters Kimberly K. Spitler and Lori B. Spitler; grandson Brennan T. Kuchar; sisters Joanne Boyer and Gene Barnhart; brother Robert Parkinson (Daunel); several nieces and nephews and many other loving family and friends. To send flowers or a remembrance gift to the family of Kay Lorraine Spitler, please visit our Tribute Store. "Email Address" would like to share the life celebration of Kay Lorraine Spitler. Click on the "link" to go to share a favorite memory or leave a condolence message for the family.